Moringa oelifera is known as “nature’s medicine cabinet” because it is loaded with minerals and vitamins, that can be an effective remedy against many kinds of sickness. Its leaves are rich in Vitamins which plays an important role in maintaining the body’s health. Let’s get to know more about the Health Benefits of Moringa, Moringa Juice Recipe and its Essential Nutrients. 1. Moringa has anti-cancer compounds or phytochemicals that help prevent the growth of cancer cells. 2. Moringa leaves helps strengthens the body’s immune system. 3. Moringa contains four times the calcium in milk, so it is advisable for lactating mothers to consume Moringa leaves, to produce more milk for their babies. 4. Moringa contains 3 times more potassium in bananas. 5. Moringa tea can help in healing inflammation of the tendons and joints . 6. Moringa can help normalize blood sugar level, which can help in the prevention of diabetes. 7. Moringa containts the Vitamin C content as seven oranges. 8. Moringa contains the essential properties which helps in improving the reproductive health especially men. 9. Moringa contains 4x the vitamin A in carrots. 10. 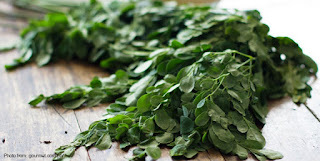 Moringa help controls blood pressure, relieves headaches and restores skin condition. 1. Remove Moringa from stems. 2. Mix 1 cup Moringa and 1 cup water in a blender.